Recycling old electrical and electronic products is easy! Why should I recycle my old electrical and electronic products? How can I tell if new products I buy can be recycled? 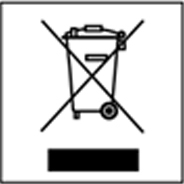 All new electrical and electronic products sold now carry a ‘crossed out wheeled bin’ symbol to help you identify which products are recyclable (or should be considered for repair or reuse). You do not have to have purchased new electrical and electronic equipment to be able to recycle your old equipment. How is The Bradford Exchange helping?